National Memorial Chorten stupa was built in 1974 in the memory of Bhutan’s third King, His Late Majesty the King Jigme Dorji Wangchuk, who is popularly regarded as Father of modern Bhutan. 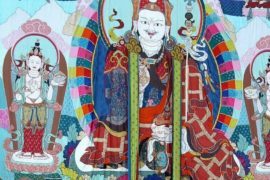 The paintings and statues inside the monument provide a deep insight into Buddhist philosophy. The engineering of the chorten has been intended to introduce it as “a standout amongst the most obvious religious structures in Thimphu”. 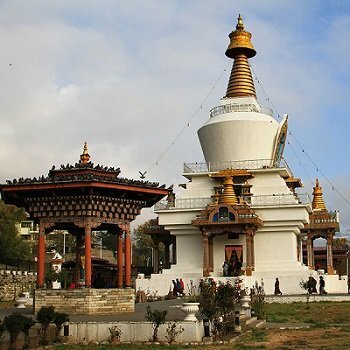 The Memorial Chorten, in the core of the city, is outlined is a Tibetan style chorten, additionally called the Jangchup Chorten, designed on the plan of an established stupa, with a pyramidal column delegated by a sickle moon and sun. The component that is unmistakable here is the outward flaring of the adjusted part to give the state of a vase (a pyramidal shape), dissimilar to a vault shape. 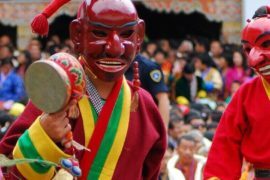 Visitors will discover elderly Bhutanese individuals circumambulating the Chorten for the duration of the day. Chorten actually signifies ‘Seat of Faith’ and Buddhists regularly call such landmarks, the ‘Psyche of Buddha’. The chorten is an uncommon case of Buddhist design and fine art with its lovely compositions and many-sided figures. The chorten is a vast white structure delegated with a brilliant tower. It is found near the focal point of Thimphu city and is one of its most notable landmarks.